With only seven more sleeps until holiday time, I've started the annual ritual of house cleaning. I'm rubbish at cleaning and will do just about anything I can to avoid it. But I hate coming back to a messy house so today heralded the start of a flurry of dust bunny clearance. The husband is a little frustrated because the nice Ocado man didn't visit this week. Seeing as how we're on a wind down - and the freezer is crammed to bursting - I've not done a big shop this week and will just buy essentials as we need them. Most of this weeks recipes will be using up stuff lurking in the back of the fridge to save it being binned. I was supposed to be making black pudding potato cakes today but after boiling and mashing the potatoes, I got peckish when Miss A had her lunch and ended up with a peanut butter sandwich instead. 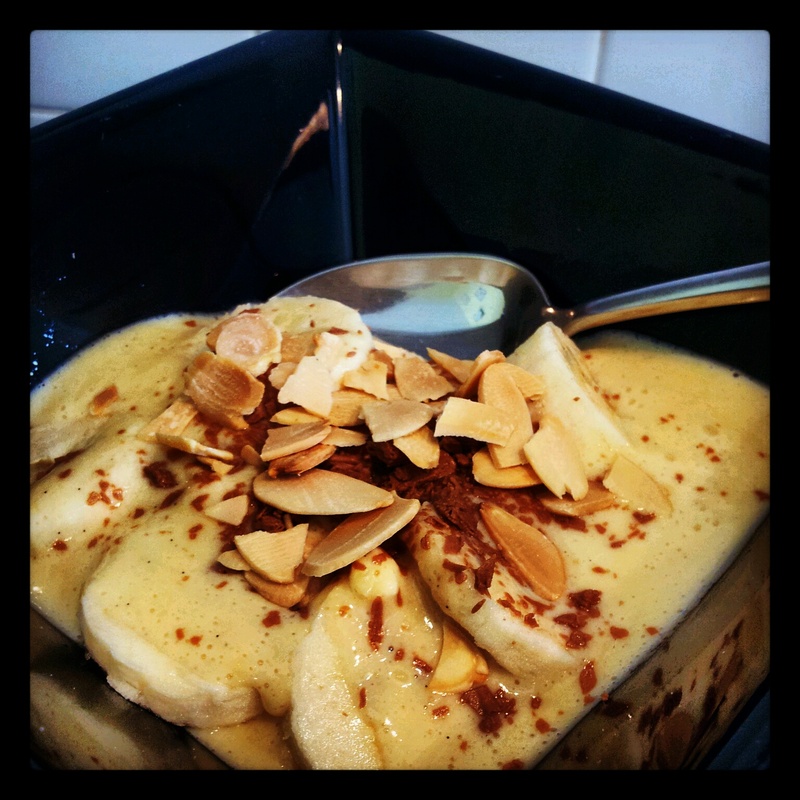 Then in a fit of domestic goddess-ness, I decided that her pudding should be home-made banana custard. I only ever eat custard at my mother's house. It's always Birds and unless we're having banana custard, I have to have my custard and pudding served in two separate bowls. I call it a foible. Everyone else says I'm fussy. But my grandmother used to indulge this habit and now my mum continues pandering to me because she wants to prove she's just a good a mother as my grandmother was a surrogate. Although I know she secretly gets frustrated that I make her wash up an extra bowl each time. Miss A loves custard. I had a tub in my cupboard which I had in reserve for topping my rhubarb and custard cupcakes and would've used to make Miss A custard, but she decided one day that it made a good floor covering and I've never replaced the tin. A quick Google came up with the recipe for real custard - or creme anglaise as I prefer to call it. What surprised me is how simple it is. I know that Birds custard is a faff of heating the milk, whisking it into the powder and then reheating the mixture until it's thick. The only difference with real custard is that you have to put a spoon of sugar, a couple of egg yolks and a spoon of cornflour in a bowl, whisk them and then proceed as above. Birds custard has been around since 1837 and was created because Mrs Bird was allergic to eggs (it says so on Wikipedia so it must be true). That's one advantage. The other being that you don't end up with two left over egg whites or a toddler throwing a tantrum because you won't let her crack the eggs. She's fantastic at getting them open, but I'm not quite sure she's ready for separating them just yet. In all it took longer to get the ingredients out of the cupboard than to make. I loved that the recipe also had a twist with chocolate and nuts on the top. Miss A stirred her chocolate in and ended up with tasty brown sludge. I then realised that we could also make Tubby Tustard (you'll know what this is if you've ever watched the Teletubbies) with the same recipe and a bit of strawberry puree. Next time I make meringues, I'll definitely use my egg yolks up to make real custard. It's a really special treat and with vanilla bean paste mixed in and chocolate on top, I can see this becoming a favoured dessert in our household.